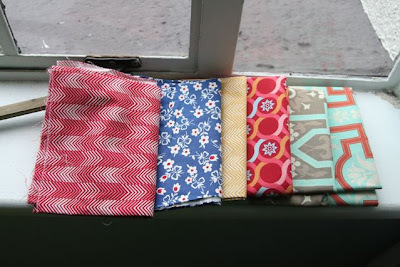 I really do try not to buy fabric without a project in mind, but I did buy a bit this weekend. In my monthly budget, I set aside a little bit of actual paper money to carry around in my pocket, and if I don't spend it during the month I can buy whatever I want with it. This month, it was this fabric! The first three I got at a quilt show I went to yesterday (more on that later) and the last three I got at a fabric store I've never been to before called Bolt. 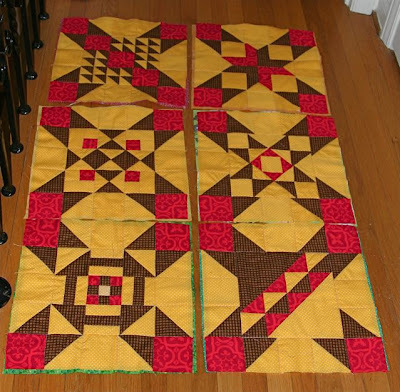 The first three are 30's reproduction fabric, and I love the chevron pattern in red and yellow. It seems very modern to me, and I think it's a good sign that it's aged so well. The second three are from Joel Dewberry's Deer Valley line, which I've seen online quite a bit, and really like. Bolt is a tiny little store on Alberta St. in Portland, and it carries a lot of designer quilting fabrics that are very, very pretty. They had the Anna Maria Horner line "Little Folks" which I have also admired online, and when I reached out to touch the fabric in the store I discovered it was cotton voile, which is super, super soft. I spent a lot of time last night searching it out online and lusting, but came to the decision that it was more the feel of the fabric I was really wanting, and that that particular line of fabric wasn't the only occurance of cotton voile in the universe. And it's expensive. Sigh. Too bad my birthday is so far away! I've been working this year mostly with 100% cotton sheets I bought at Ikea. The limited palette might actually be a good thing though. 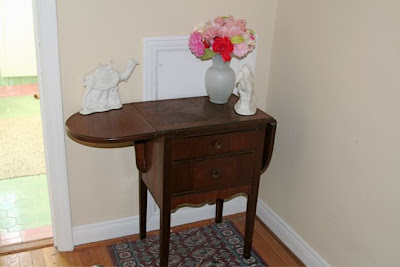 The colors are all very classic, and color matching has never been my strong suit. 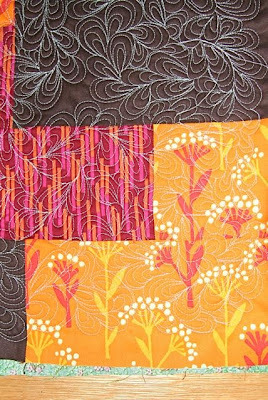 It's not like I forgot I liked free motion quilting, I just forgot how much I enjoyed it. It's mentally taxing, but not overly so. It doesn't involve a lot of steps. It's just a matter of sitting and sewing, which is nice, nice, nice. 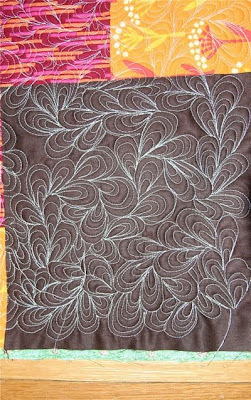 I've been using the setting blocks of my BOM club to practice free motion quilting patterns, and I quite like this one. The only issue is that it takes quite a bit more time. Last night I whizzed through six blocks using stitch in the ditch, and tonight this one block was it. I also use a whole lot more thread. I just blow through bobbins when I'm doing stuff like this. I have been using a more expensive thread topside, and it's been easier to use. There isn't such a huge build up of lint with it, even though it is %100 cotton like the cheap-o stuff I was using before. I think all the little shapes look like mussel shells. They're fun to make too. It's been almost a year since I started my block of the month club, and while I've kept up with the blocks, I haven't really kept up with quilting them as I've gone. I'm in the midst of setting up one quilt and finishing another, so I thought I'd take the evening to catch up. I've been using these blocks to practice free motion quilting, and with these in particular blocks I've been practicing stitching in the ditch. My success varies with how much I'm paying attention, how I pressed the back of the block and the direction of the wind. Har, har. I'm having more success with getting a consistent stitch length, so I'll take my victories where I can get them. I'm hoping with time it will become easier. 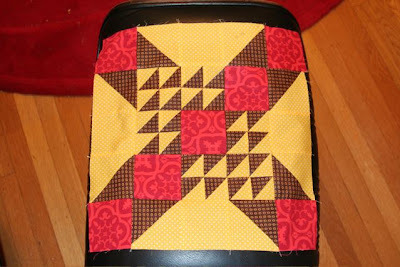 Secret quilting and working a lot more hours definitely puts a damper on my desire to blog. 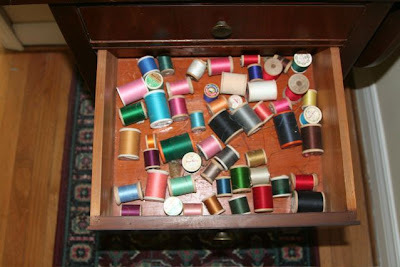 I only worked for 45 minutes today, so with oceans of free time on my hands I thought I'd take some photos of the thread assortment that came with an antique table I bought when I was furnishing my house. Now, I would have bought the table either way. It's a good fit for the space it's in, and I like the wood finish. 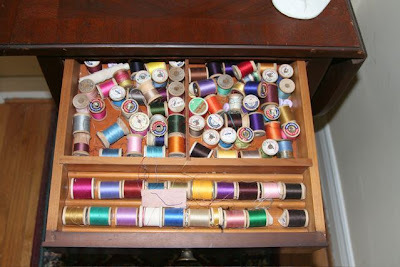 But all the thread inside the drawers are very pretty. I know that old thread isn't really ideal for quilting, but sometimes it's nice to have it available for when you need a little bit of just that right color without having to run out and buy a spool that you won't use half of. I'm guessing from the labels that the thread is from the 60's/70's. 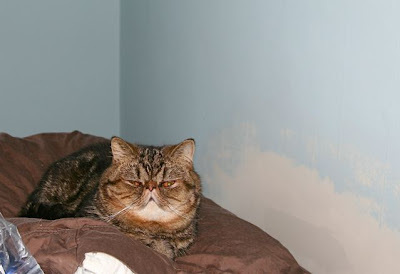 Sometimes I dream of hiring an assistant. I'd have to pay them in diet coke, but it would be pretty nice. They could do my laundry, clean my kitchen and help me out with all my least favorite parts of quilting. This dream is especially strong when I'm doing three things during the quilting process. The first is winding bobbins, and the second is assembling the quilt sandwich, and the third is attaching the binding. It's a slippery slope from there though. I'd probably end up watching my magical assistant assemble the whole thing while I called out instructions from the couch while playing video games. 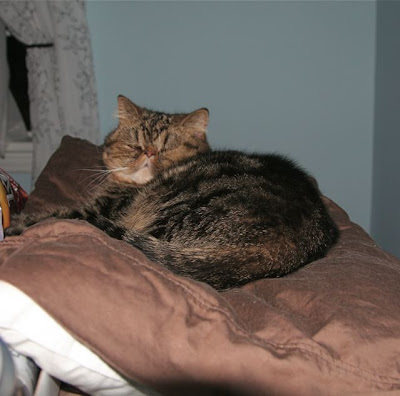 When I made my first quilt, I was at my old house in Salem. There were a lot of things that weren't ideal about that set up, but I did have a lot more floor space, and room for a full size ironing board. I love my new place, but it's been a real challenge to try and assemble the quilt sandwich. I'm either going to need to clear some space in my garage (which isn't attached to my place), or go to a friend's house to spread out bigger quilts. 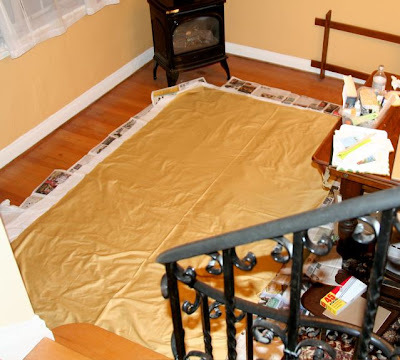 Here's a picture from the stairs of the quilt sandwich for the quilt I'm writing a pattern for now. That's just half of it. I thought I could maybe fold it over and do half at a time, but that didn't work out to well. Nothing was really taut, and there were some wrinkles in the batting. Never again. Speaking of batting, I've been using my Joann's coupons to buy batting, and I'm really not feeling the cotton batting I bought for this quilt. I feels cheap and flimsy. I used bamboo last time, and it felt so much nicer. It was so soft and hefty. I didn't want to buy it because it was so expensive, but maybe I'll have to bite the bullet and just get it. I realize my arbitrary timeline for making 6 patterns in three months was a little crazy. I'd had the intention of designing quilts that could be completed in a weekend, so I could make the quilt one weekend, write the pattern during the week, and test it out the next weekend, but it hasn't really worked out that way. It's been two weeks and I'm just now completing the first quilt for the first time. I still think that's pretty good, but I'll just have to see where I am in 3 months. The most recent block we had for my Block of the Month class at Cool Cottons was the one pictured above, called (I think) Cut Glass Dish. 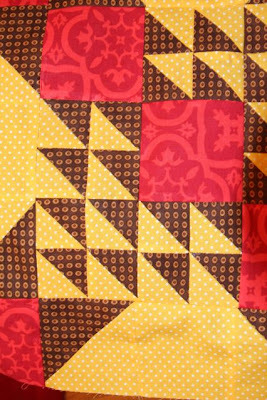 My piecing skills are still a little shaky for triangles, but I think the magic of using sizing has helped considerably. I think the points are looking pretty good, but there is always room for improvement. I wish I had used sizing when I made all the sashing, but short of a time machine, there's not much I'm willing to do about it. 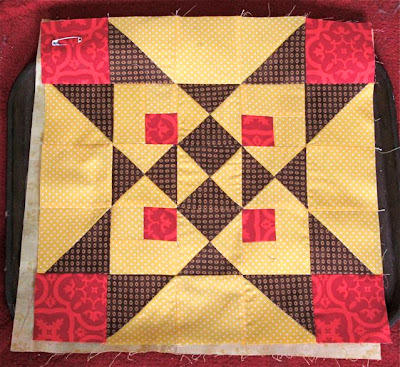 I'll get two more blocks in class, and I'm up to date on all the blocks, but I have a lot of quilting to go. We're doing the quilt as you go method, which I like, but I've been sort of consumed with my quilt pattern project, so I haven't really been quilting the pieces. The BOM quilt is supposed to be done in March, so I should be getting a move on. An idea that came up in the BOM club was to cut 2 inch squares and sew them together as starters and enders to the sewing process, which eliminates the birds nest you can get when starting out on the machine. I decided to do this, and have created these blocks so far. Again, sizing is doing wonders for my seam matching. I can't wait until I have a bunch of them. I'd like to think I'm a pretty modest person. I don't brag much to my friends, or talk about how awesome I am (at least, I think I don't!). I'll admit here though, that I have a pretty active fantasy life. Whenever I start something new, I like to imagine scenarios where I am adored and admired for the new thing I'm trying. For example, when I started design school, I would imagine scenarios where I was an award winning designer, featured in design magazines, and begged by my design school to come back and talk about what a wonderful designer I was to students who were once just like me. Now, here's the thing. I'm not a great graphic designer, I'm not bad at it, but I'm not great. I know that now, but at the time it was fun to think about fame and fortune. I'm very much okay with the fact that I'm not some world famous designer. I realize that most of my fantasy life is just that, a fun fantasy. Do I fantasize about becoming a famous quilting personality? One with seven million blog followers, and my own line of fabric? Oh heck yeah. Will it ever happen? Probably not. All that being said, one fantasy I don't think is outside the realm of possibility to design a quilt, and have the pattern published. I've cruised quite a few blogs where people have published patters, so it seems sort of accessible. All of that was a very big lead up to the fact that I've been working on a pattern all weekend, but I won't be posting pictures of it, because I'd like to submit it publication, and I don't think I can if I do it here first. I'm going to see if I can write six patterns in the next three months, at two weeks for every pattern. We'll see if I can stick to it. In other news I washed Broadway Boogie Woogie Pt. 2 yesterday, and am pretty pleased with how it looks washed. The quilting crinkled up nicely. It is tremendously satisfying to finish a project. I'm also still working on my BOM class quilt. 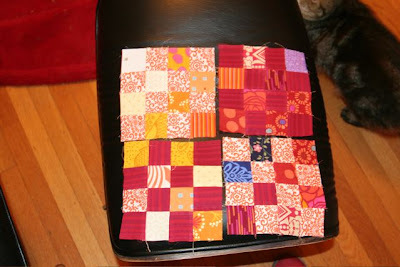 I've caught up on all the blocks, and just have to add sashing to three more. I haven't been using sizing until now, and it's making a big difference in how well my seams match up. I'm not 100% there yet with seam matching, and having the final size come out right, but I'm getting closer. This block is called Four Corners. I like it a lot. On of my favorite thing about patchwork quilts is the way the positive and negative space interact to create more complex shapes.